PLEASE NOTE: These Havdalah beeswax candles burn extremely hot and are not meant for every day use. They are made and used for a special Jewish ceremony. 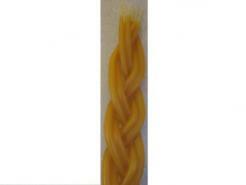 We offer five sizes of twisted Havdalah candles and four sizes of braided Havdalah candles. Beeswax Candle Works, Inc uses only 100% USA beeswax in making these special candles. 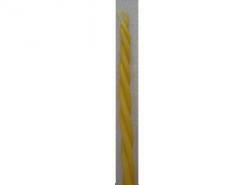 We make these beeswax Havdalah candles by first hand dipping 5" or 12" tall x 1/4" tapers. We then either twist or braid the dipped beeswax tapers together, and then give them a final dip in our 100% pure USA beeswax. We have a few 6 Wick Flat Braided Havdalah Candles on Clearance available - limited quantities!